Highlights - Cycling past the gardens in and around Bright. My tip - Visit in Spring, during the Bright Spring Festival and combine your cycling with visits to some of the beautiful open gardens. The Murray to Mountains Rail Trail in north-east Victoria is Australia's premier rail trail. Very much at the vanguard of cycle tourism, the trail has been overwhelmingly successful in attracting visitors to the area and encouraging the growth of a variety of local businesses which cater to the needs of rail trail users. David and I first cycled the trail with our young boys almost twenty years ago. We had free bikes provided by a motel and, frankly, they were awful so we didn't get far, but despite faulty gears and dragging brakes we had a wonderful family holiday. In the intervening years, we have returned again and again, watching new sections of the trail open, old sections improve and local businesses succeed and grow. Evidence of the success of the trail for local businesses. The Murray to Mountains Rail Trail is probably the best supported trail in Australia. It has trail-side accommodation, cafes, restaurants, wineries and bike shops as well as shuttle and bag moving services. If you are thinking of giving rail trail cycling or hiking a go this is a great place to start. Don't be put off by the distance, the trail can easily be tackled in sections. David and I rarely cycle more than 50 kms in a day. We base ourselves in one of the local towns, usually Bright, load the bikes on the car and start from a different point each day. If you want to see the trail at its scenic best, go in spring when the flowers are in bloom, and if you haven't got the whole 100kms in you, concentrate on the Bright end. The trail between Bright and Everton is lovely. This is a magical ride. It was added to the trail a few years ago to connect the then beginning of the trail at Bright with Wandiligong, an old gold mining town. I have described this part of the trail in a separate blog post so I won't repeat myself here, but if you are based at Bright it makes for a great little excursion. Click here for my blog post on this section. Easy, sealed and flat, this makes a lovely return ride. One way the ride takes about two hours. With lots of quaint little cafes in Myrtleford, we like to set out in the morning, have lunch at Myrtleford and then cycle back in the afternoon. 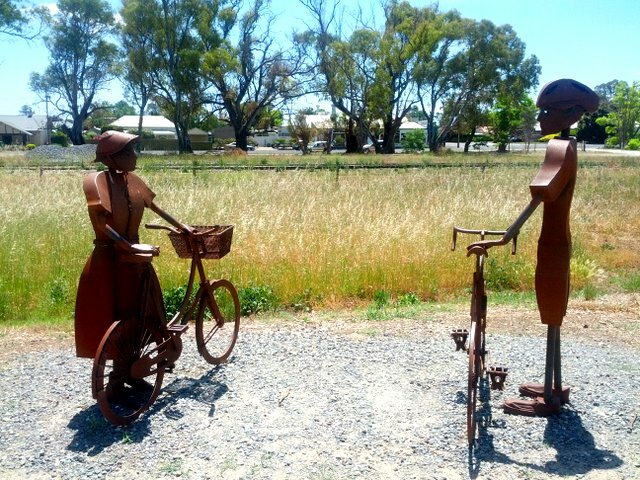 Don't worry if the distance seems a bit daunting, Porepunkah just 6 km from Bright has the Rail Trail Cafe right beside the path where you can take a mid-cycle break, and there is no shortage of nearby wineries for a spot of wine-tasting or gourmet lunch. The old station at Eurobin about mid-way between Bright and Myrtleford has water, toilets and shade and oozes outback charm. An old gold stamping battery beside the trail at Myrtleford. This part of the trail runs through farmland and native bushland. It is still scenic but less pretty and quaint than the Myrtleford to Bright and Bright to Wandiligong sections. It is a bit of a climb up to the site of the old station at Gapsted but nothing too difficult provided you don't hit it at the end of the day when you're tired. Does anyone recognize this? I think I took it in Everton. This is our least favourite part of the trail. It has none of the charm of the other sections but knowing you cycled the entire trail is its own reward. Wangaratta is a significant regional town with all the accommodation, restaurants and bicycle shops you might want. The trail as it passes the old station at Eurobin between Bright and Myrtleford. From the old Everton Station site a side-trail climbs steadily up to Beechworth. This is the only part of the trail which has a significant gradient. Do you yourself a favour and start at the Everton end, that way it will be all downhill on the way home. Beechworth is Ned Kelly country. If you are interested in the early colonial history of Victoria there are more than enough period pubs, shops and museums to keep you amused for a day or so. The old Telegraph Office at Beechworth. We sent our son a telegraph from here - pity about the modern office chair. We haven't cycled this section of the trail. However the reviews I have read say it is flat and easy and a great ride if you like gourmet foods and wine. I want a bike like this - and don't tell me it isn't practical because I don't care! What do you think of my 'pretty in pink' dream bike? we're at a stage where my daughter is too big to sit on the back of my bike for long rides, but she's not quite ready to ride long ways on her own. in a few more years i'd love to do trip like this. My experience is that children love cycling with their parents. I only have boys but I don't think girls would be that different. I know what you mean about the difficult age though. In the US and lately in Australia you see those bikes with a child's bike (sort of half a bike) attached at the back. They didn't have them when our boys were young but they look like a great solution to me. Failing that, give it a few years and she'll be out-distancing you - lol. Victoria is so varied. If you have never been to places like the Great Ocean Rd, Raymond Island and the East Gippsland Lakes District you are missing a lot. I sort of wish I could cycle when I see these trails. Gordon would be happy too. We sometimes see people on tricycles if you really can't manage two wheels. It isn't hard though. I think I'm going to ask for one just like it for Christmas this year. 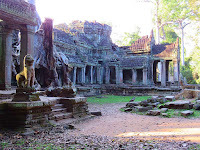 Hi Lyn, a very enjoyable post and great photos. I would love that bike too. It is very girly isn't it - the bike that is not the ride. Its not at all practical for the rides I cycle but as a friend of mine says what's wrong with 'style over substance' - lol. That bike is at least a little bit practical - it includes a basket to carry your belongings. Great trail, I like the statue of the bikers. I used that statue as my profile picture for ages. It is great isn't it. Reminds me of D and I after we have cycled too far - sort of old and rusty! Hi Lyn, Thank you for joining #TheWeeklyPostcard this week-end. This is a beautiful bike trail and I sort of envy you for being able to bike so good. I used to do it too some years ago, but I've got into an accident and since then I'm sort of scared to hop on the bike again. I write about Rail Trails as a cyclist but they are also for walkers and some for horse-riding as well. Lyn, Another great bike trail! So many. You never get bored, do you? Haha - Cycling has transformed our travels. It is just such a lovely way to see things and you don't get lazy from sitting in the car all day. The pink bike is PERFECT, and don't let anyone tell you otherwise! :) I'm not an avid cyclist myself, but this trail sounds totally adorable and really appealing! Great post, and thanks for linking up with #TravelTuesday! Thank you. I absolutely agree with you about the pink bike. Haha - I have been cycling in Singapore too. There is a great path along next to the sea - perfect for families. So great to see that cycling has brought such prosperity to this area. Loved the description of the hotel bikes. I have read a lot lately about the Great Trail in Canada. I gather it is almost complete. Now wouldn't that be something - to cycle across your country on a dedicated trail the whole way. Maybe you and I should put that on our joint bucket lists.